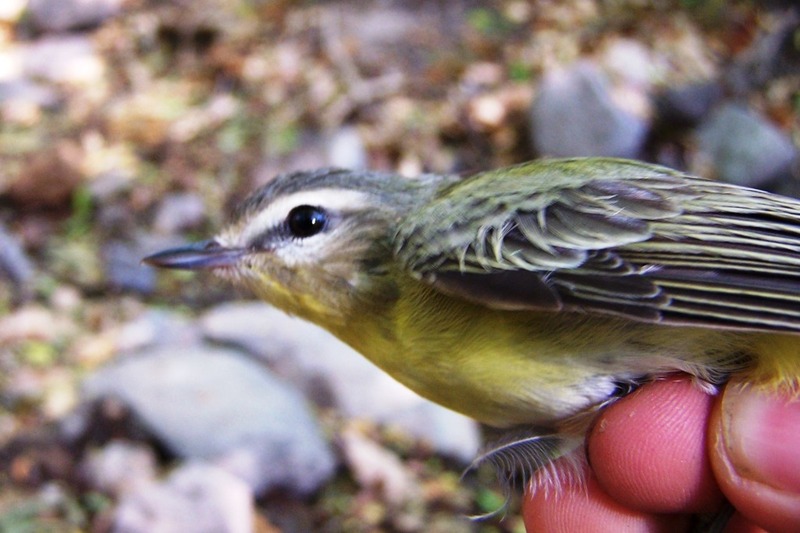 We have been monitoring bird populations in Laguna de Apoyo Nature Reserve for a few years. We count birds in a procedure called point counts, in specific sites each month, and we also catch birds using mist nets designed specifically for studying birds. Here are some pictures of birds who have fallen into our nets, which give us an excellent opportunity to admire them up close and in detail. Stripe-headed Sparrow (Aimophila ruficauda). Photo by Joe Taylor. 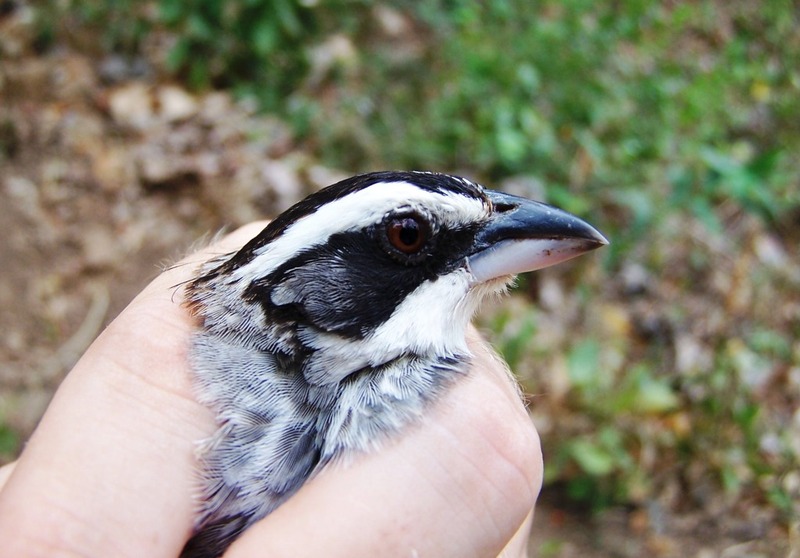 Although many sparrows are birds of open lands, the Stripe-headed Sparrow (Aimophila ruficauda) prefers forested land. The Stripe-headed Sparrows always stay in flocks which sometimes include other species. They are most often encountered in tall brush and vine tangles, occasionally foraging on paths and small roads, and never without the company of others of their species. 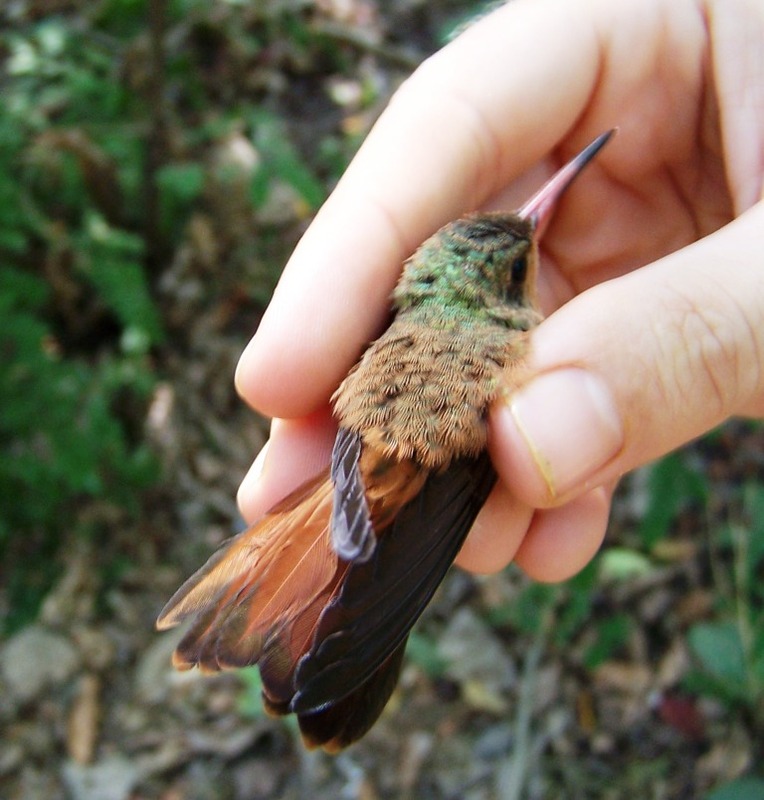 Cinnamon Hummingbird (Amazilia rutila). Photo by Joe Taylor. The most common hummingbird in disturbed areas, yards, and pastures in the Pacific region of Nicaragua is doubtlessly, the Cinnamon Hummingbird (Amazilia rutila). This species is also a common hummingbird in Laguna de Apoyo Nature Reserve, where most forest is broken by tree falls, roads and agriculture plots, and houses, as well as deep into the best quality forest. It is the largest of the hummingbirds in the area. Its red bill, rufous underparts and tail, and green back are diagnostic. It is a year-round resident, prominent and easily distinguished, so birdwatchers almost always get this one on their lists during a visit to Laguna de Apoyo Nature Reserve. A migratory Empidonax flycatcher. Which one is it? Photo by Joe Taylor. Any birdwatching enthusiast knows how enigmatic the Empidonax group of flycatchers is. Several are practically impossible to distinguish in the field, and the distinctions are not entirely clear for some species even with a bird in the hand. When seen in the north, on their nesting range, they are often identified by call and by location. These migrants may be mixed when in the southern range, however, and they don't sing here! Joe captured this one in his monitoring work in Laguna de Apoyo Nature Reserve. Can you identify this bird? The Blue-tailed Hummingbird (Amazilia cyanura) is distinguished from the Steely-vented Hummingbird (Amazilia saucerottei) by rufous secondary feathers. Photo by Joe Taylor. 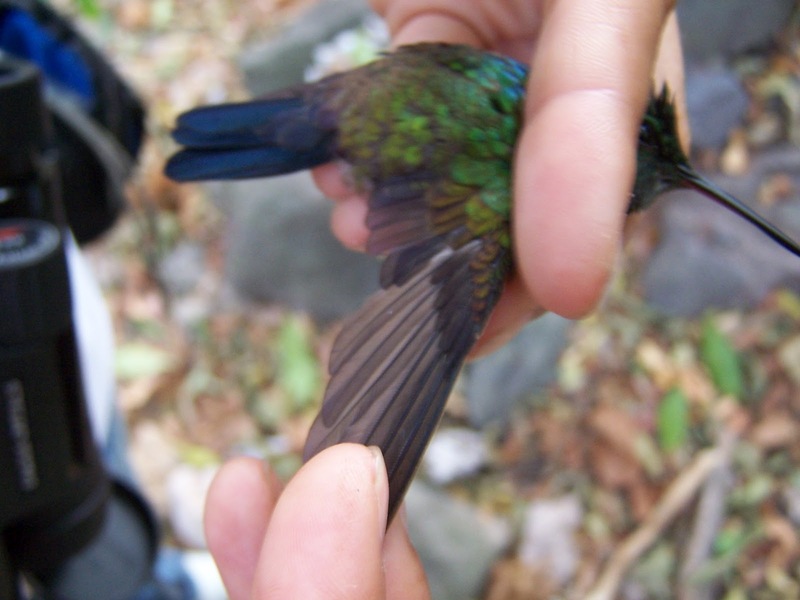 Among the more enigmatic birds of Laguna de Apoyo Nature Reserve are two: the Blue-tailed Hummingbird (Amazilia cyanura) and the Steely-vented Hummingbird (Amazilia saucerrottei). The bird in Joe's hand has a few rusty secondaries, making it the former. Both species are found here, so we are working on our identification skills to distinguish them. The Ovenbird (Seiurus aurocapillus) a nearctic migrant, and not particularly easy to see when it is here. 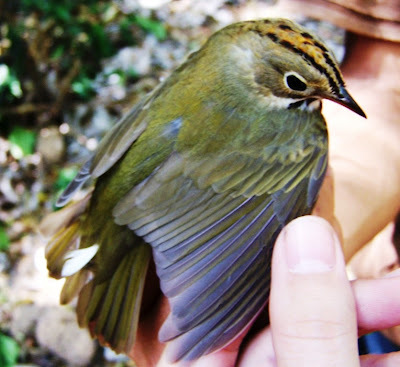 Mist netting has produced more Ovenbird captures than we would have expected from point counts. Photo by Joe Taylor. Another migratory bird that spends its nonbreeding season in Laguna de Apoyo Nature Reserve is the Ovenbird (Seiurus aurocapilla). 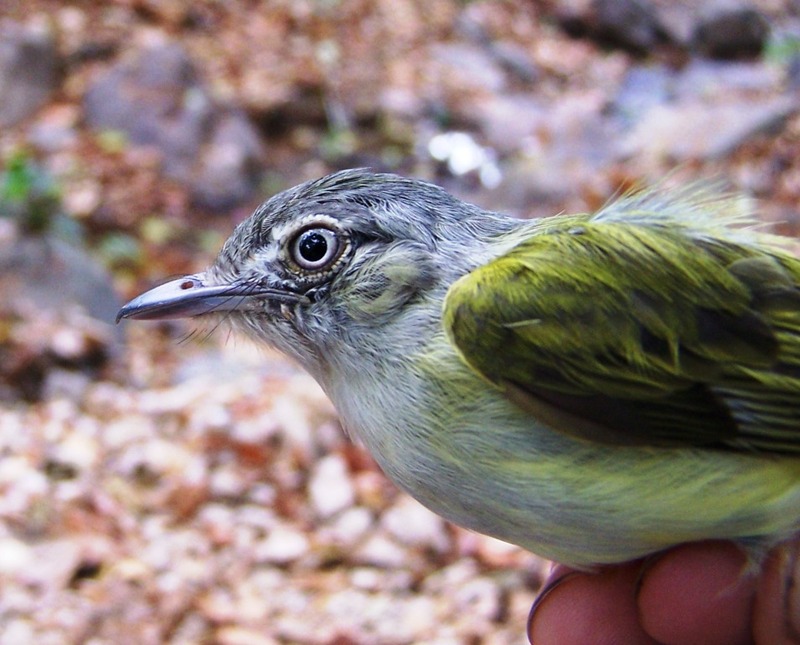 It is the most unlikely of the North American Warblers (Parulidae), not much like any of the others. The Ovenbird can be found in the undergrowth beneath a forest canopy, usually solitary or near thrushes. Even in its winter range, it is territorial, and is rarely found near other Ovenbirds. The Ivory-billed Woodcreeper (Xiphorhynchus flavigaster) is resident to the Laguna de Apoyo Nature Reserve. Photo by Joe Taylor. Woodcreepers are among my favorite birds. Their presence signifies something is still good about a forest. For instance, the Ivory-billed Woodcreeper (Xiphorhynchus flavigaster) and a few other woodcreepers (Family Furnariidae) are found in Laguna de Apoyo Nature Reserve, but not just anywhere. They seem to be bellwethers for forest quality in this context. 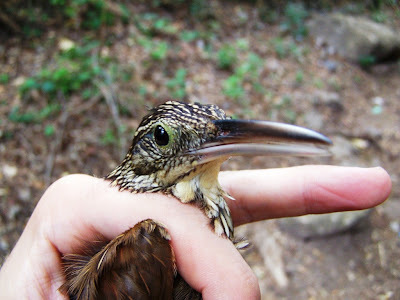 This individual was caught in a mist net in the southwestern part of the reserve, whereas no woodcreeper is seen in the northern part of the reserve. The Red-eyed Vireo (Vireo olivaceus). Photo by Joe Taylor. Some birds spend the entire calendar year in Laguna de Apoyo Nature Reserve. Others migrate between here and other places, mostly further northward (although some notable austral migrants also come here). Still other birds breed in North America and winter in South America, using Nicaraguan territory to stage a stopover in either the northward or southward trip. One of those birds is the Red-eyed Vireo (Vireo olivaceus). The pictured bird was presumably in our vicinity only a few days or even less time. Yellow-olive Flycatcher (Tolmomyias sulphurescens) in Laguna de Apoyo Nature Reserve. Photo by Joe Taylor. The tropical dry forest habitat of Laguna de Apoyo Nature Reserve is ideal for many tyrant flycatcher (Tyrannidae) species. 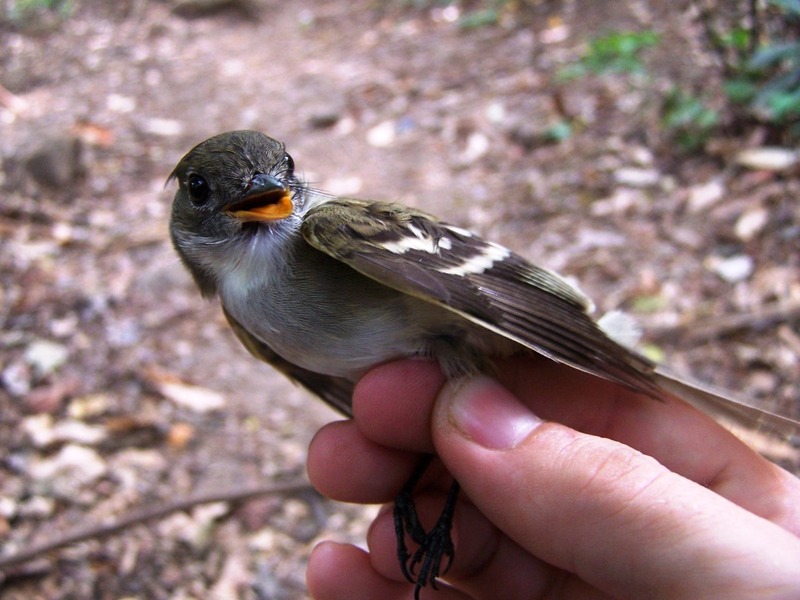 Although by no means the most conspicuous, the Yellow-olive Flycatcher (Tolmomyias sulphurescens) counts among the more common of them. Sometimes this bird is called the Yellow-olive Flatbill, which reflects its particularly wide, flat bill, even for a flycatcher. 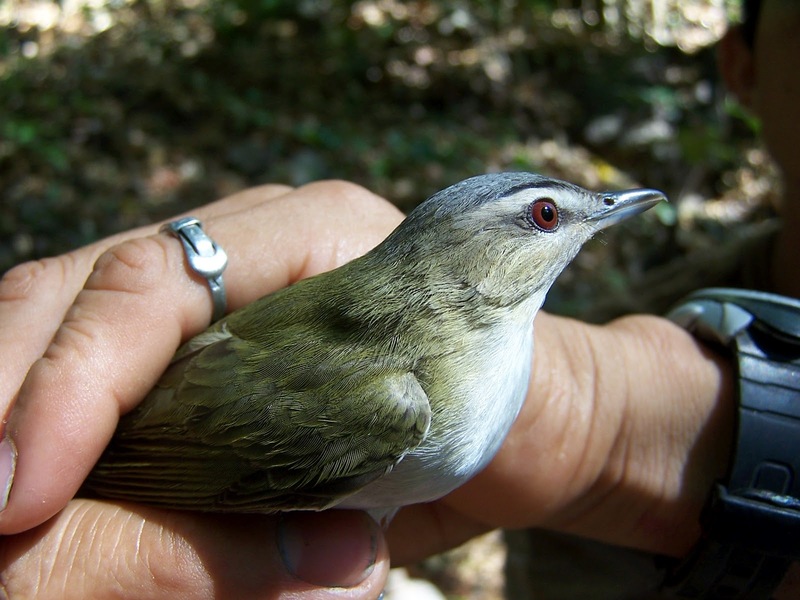 Its atonal hiss, however, is common, and its size and posture may fool some observers to think it may be a vireo. It is a year-round resident, and abundant everywhere in the reserve. A careful birdwatcher will find this bird in almost every birding excursion. Philadelphia Vireo (Vireo philadelphicus) in Laguna de Apoyo Nature Reserve, Nicaragua. Photo by Joe Taylor. During the months from September through May, nearctic migrants fill the trees of Laguna de Apoyo Nature Reserve. The most common migratory insectivorous bird is the Yellow Warbler (Dendroica petechia), with several other species often found nearby. Among them is the Philadelphia Vireo (Vireo philadelphicus). Considerably more sluggish than the more common Yellow Warbler, it may be overlooked, but it is not uncommon during its time here. Birdwatching excursions in Laguna de Apoyo Nature Reserve and other parts of Nicaragua can be arranged with our staff. 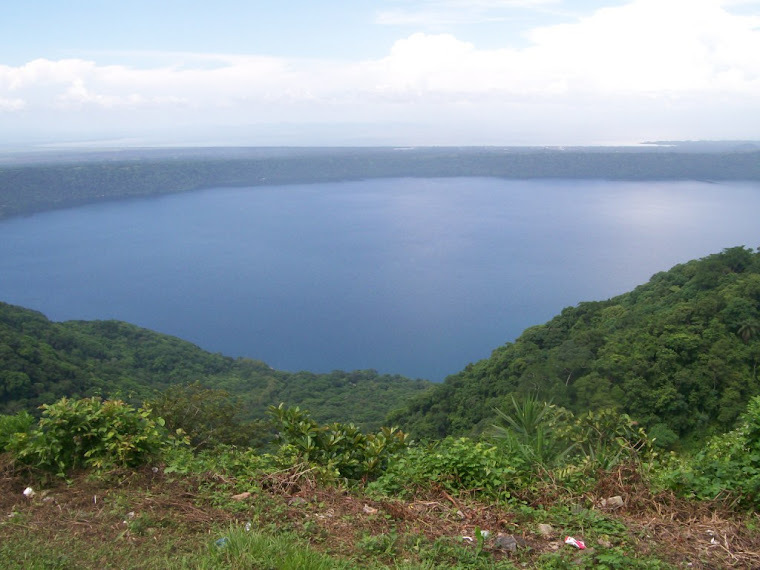 We know the birds and the area of Laguna de Apoyo Nature Reserve, and we would love to share them with you. Please contact us if you would like to go birdwatching with us, or if you would like to do an internship on bird studies with us.